Since 1968, from our facility at 1091 Industrial Park Drive, we’ve been sharing happiness with Marietta and the greater Atlanta area through the production of our Classic Coca-Cola glass bottle. Just recently, the team unveiled a hand-carved wooden iconic Coca-Cola bottle which is sure to become a local landmark for years to come. In the fall, the local utility provider trimmed the center point of the front entrance in preparation for winter ice storms. After removing the limbs facing the power lines, the facility was left with the problem of redoing the front landscape to ensure they would regain the plant’s curb appeal. We have many employees who have watched this tree grow and mature over the last 30 years. Knowing removal was eminent, we started feeling (and hearing) the sentiment for our beloved tree. During the dreaded day of the tree removal, midway through the process, the significance of chopping down the rock maple tree began settling in- limb by limb. Ricky Waddle (QA Technician) and Paula Redman (Office Admin) spearheaded the endeavor to find options for what remained and to not completely lose ties with our tree. In group discussions, we recalled carvings which had previously been marveled over during trips to the North Georgia State Fair. Paula then began the hunt for the best wood sculptor to carve our tree into something just as beloved, if not more so … an iconic Coke bottle. 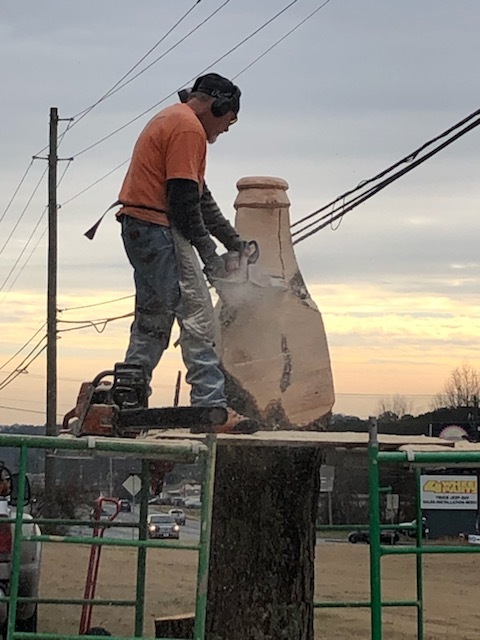 Our Marietta team commissioned professional chainsaw sculptor Brian Ruth to take on the task of creating the larger than life 9-foot-tall monument to refreshment. Over the course of two days he labored; often visited by associates looking to document his impressive process with their own personal photos. 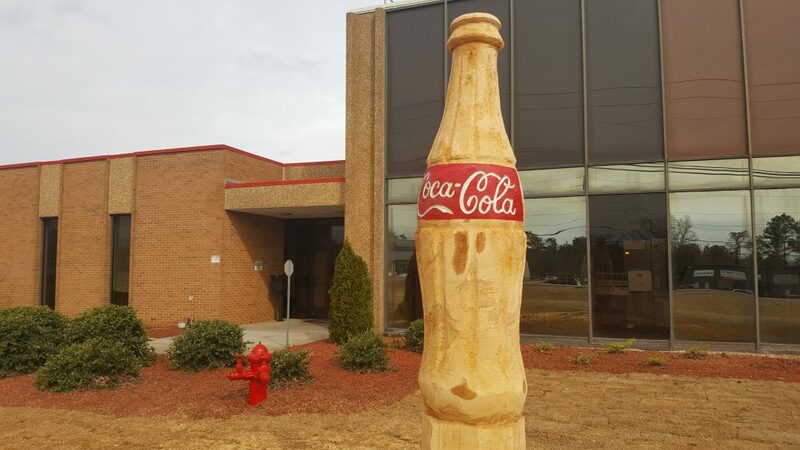 Our Marietta Coca-Cola team was awe-struck by the dedication and hard-work of Brian Ruth and craftsmanship of our one of a kind sculpture- with 30 year old roots. Those passing by will have varying ideas, opinions or even memories when they see the new work of art in front of our facility. However, to us, our sculpture embodies everything that we, at Marietta Coca-Cola and Coca-Cola UNITED, stands for.